Welcome to the LME Library Homeschool & Educator Resource Page! Like most public libraries, the Lillie M. Evans Library serves homeschool families and educators in our area. To assist educators and learners with their needs, we have developed a section of our website for our homeschoolers, educators and students. This page includes links to online resources as well as tips on using the library catalog. We have persistent links that support areas of curriculum directly into RSAcat, our online catalog. Finally we have information about any local groups that focus on homeschooling activities. The LME Library is a member of the Resource Sharing Alliance which makes it easy for our users to search and to borrow materials from almost 200 libraries in central Illinois. RSAcat is our library online catalog and is how our staff and patron searches for materials in our collection. RSAcat can be limited to one library or all of the RSAcat When you search for items from our LME Library homepage, materials are first limited to the LME Library collection. This bookmarklet will allow patrons to check for any book they are looking at on an internet page to see if it is available RSAcat. Here is the link to the instructions and the bookmarklet. You just drag it into your favorites bar: http://www.librarything.com/forlibraries/bookmarklet/1750.a6f/Resource-Sharing-Alliance-NFP-Enterprise-account- Install it on your computer and play around, it works quite well. In addition to searching for items in the RSAcat, library users can use the RSACat’s ‘My Account’ feature to easily view library account information, renew items, and manage holds. Please visit http://lmelibrary.org/index.php?option=com_content&view=article&id=16&Itemid=200 to review these features. You can also make and edit your own lists. 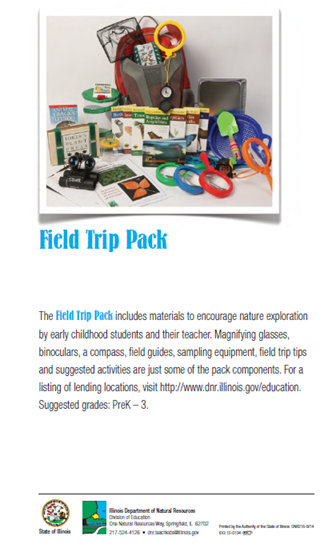 The LME Library has 2 field packs from the Illinois Department of Natural Resources available for checkout. 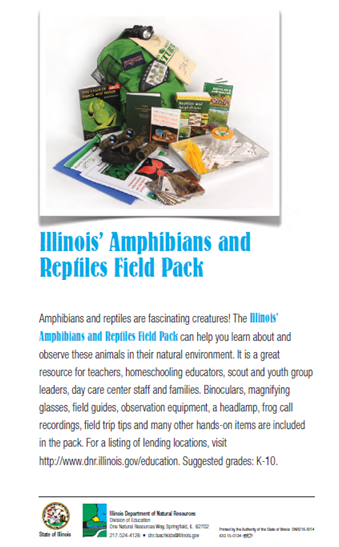 These packs are ideal for hands-on exploration of the natural world and circulate for 2 weeks. Click images for links to library catalog. One of the librarian's favorite links is for The Partnership for 21st Century Skills (http://www.p21.org/). P21 is a national organization that advocates for 21st century readiness for every student. P21 and its members provide tools and resources to help educators keep up by fusing the 3Rs and 4Cs (Critical thinking and problem solving, Communication, Collaboration, and Creativity and innovation). APACHE (Association of Peoria Area Christian Home Educators) is a not-for-profit corporation governed by a volunteer board of directors. They are not a membership organization, but instead offer a monthly newsletter, annual convention, used curriculum fair, and various events throughout the year. Rainbow Resource Center - Based out of Toulon, IL, Rainbow has educational resource supply company for homeschoolers. Their newsletter is available online or by email. They also have an information page for homeshoolers and live help through their consultants.